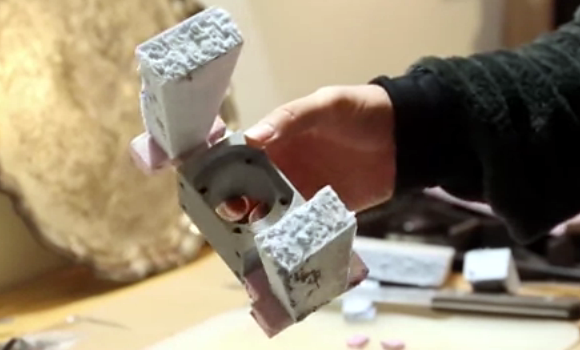 Turning 3D printed plastic parts into metal objects is not a new concept. But we don’t see a lot of it and enjoyed watching the documentary version of [3DTOPO’s] lost PLA metal casting process so much we figured you’d want to see it too. The thirty-five minute video walks through every part of the process which we originally learned about in September of last year. The process was developed as a way to fabricate parts that will be used in high-stress applications. For instance, the part seen above is a mounting bracket for the ball screws that moves the Z axis on a huge CNC build he’s been working on. A plastic part will break under the strain so he needed to make it out of aluminum alloy. To start, the piece is modeled and printed in plastic to check the fit. Once it’s just right he scales it to 103% and prints it again to account for the shrinking of the metal as it cools. The next step is pictured above, adding paths using rigid foam insulation that allow for the metal pour and for air to escape. This is packed into a plaster and sand mold which dries before being cooked in a furnace to vaporize the foam and PLA. This leaves a perfect mold for the metal pour. After the break you can see a 5-minute overview version of the project. I liked the detail about the 103%. That’s a rule of thumb, it isn’t consistent but varies with flow turbulence, thickness, cooling rate and other hard-to-pin-down issues. All those precision plastics you use every day involve hours of trial and error during the design process to get the right dimensions when it cools. Even with injection mold simulators, a lot of it is art and gut feel. You are talking about injection molding, this process is more like investment casting. The most important factors are the material / alloy and pouring temperature. If you know the shrink rate of the alloy and the pouring temp you can easily hit .002 per inch. Or if you switch to a Zinc alloy like ZA-18, you can enjoy 1% shrink and a stronger part. Instead of printing in PLA and vaporizing it. do a further process to make a wax copy and use the lost wax method. you dont need as high of temperatures. He already has the furnace, so lost PLA isn’t that bad for him since it lets him pre-heat the mold anyway. If you wanted to do lost wax using this mechanism you could probably print a very thin negative with PLA, just enough to give it structure, then fill with wax and dissolve the PLA, but it’d be an extra step in the process. You don’t need to – you can purchase machinable wax for part prototyping with has holds dimensional tolerances very well. Should work just the same, only without the waste of propane. That really is just extra work. You would still need to burn the wax out. And the propane I used for heating the mold is negligible. Great now I can cast my 3D printed gun with something more substantial. I did a lost PLA cast of pewter using plaster of paris for the investment and a gas grill as the heat source a couple months ago. It worked well enough, but a nice furnace would definitely be helpful. Great, you can use this technique to increase the durability of your 3D printed gun! I’d like to see someone do that. While this is a great tutorial and a darn fine hack, I think that the same part could be machined out of a chunk of billet in about 15 minutes by someone skilled with a Bridgeport. You couldn’t mill this manually, the outer curve would be too difficult to reproduce. You’d have to broach it. With a Bridgeport and a Indexing Head you could make this, though. With a more traditional design, a pocket for keyways would have been milled and hardened keys would have been dropped in for the double D shape. Off the top of my head, the centerline of the keys would be tangent to the diameter, that way you could bore out the hole and still key it. Don’t take my word for this, right now all I really remember is that the numbers all make sense, there’s a reason for dimensions. Another possibility is a 3 piece design, the large concentric central holes would have been turned on a lathe, and 2 plates screwed to the outside. There are actually standards for them ANSI ISO ASME, Machineries Handbook has a section on key and keyways, and if memory serves the section on D shape standards is right near the section on Keyways and Splines. A really good machinist never says “Perfect” there’s no such thing in the real world, only good enough. I didnt finish a sentance. I see nothing on this part that would make it impossible or even all that difficult to reproduce on a manual mill… However, as i do not own a mill… and melting metal is always fun, I too would cast it. 3DTOPO here. The point is﻿ that you could use this same method to cast parts that would be impossible to machine even with a 5-axis machine. That said, I didn’t have a billet on hand, or an end mill long enough so I would have had to order one which cost far more than this method, not mention I would have had to wait days for the part. I have gone from design to cast part in the same day with this method. Would be interested to see what a cut section of aluminium cast using that kind of investment looked like. I’ve tried casting aluminium into an open back mould made of plaster of paris. Yes the outside looked sound but a cut through the metal showed a huge number of steam holes set into the alu. It’ll be water of crystallisation, ie water locked in the plaster’s chemical structure. It comes out when set plaster is heated up. If you heat up Plaster of Paris as done here, that water does escape as it turns back into powdery gypsum, but the mould frequently turns into a pile of dust in the process. Perhaps burning out added some kind of steam tight seal to the inner surface of the mould? I have seen that cast aluminium parts should not get to thick (the limit is probably around 5-10 mm). Beyond that the gases in the molten metal can not escape the part while casting it, resulting in trapped gases/bubbles. If your part would have to be airtight this will be even more important as those bubbles might end up allowing air to escape through the part through tiny pores or holes small enough to not be visible to the naked eye. The will show as a small stream of air bubbles when you pressurise the part under water though, akin to when looking for a leak in a bicycle tire. Would adding Na2CO3 (soda) help? I don’t know, I wasn’t involved in the casting process, only assembling the finished parts. Yes I have heard Na2Co3 can help prevent degas molten aluminium , Never seemed to have any need for it- I’ve been using worn out alu engine blocks/pistons as melt stock, and the metal seems very clean/free of gas. I don’t think the flaws in mine were from gassy metal. Same metal heated up just two pours from same melt. 1st mould green sand mould that was a bit damp to the touch. Instead of pouring surplus melt into a muffin tray for button ingots next time , the surplus went into a simple plaster mould as a kind of test for plaster moulds. Metal in the bone dry plaster mould was bubbly, but not that cast in the damp green sand mould. My very first castings were done as a kid in plaster of paris with electrical solder that I’d managed to blag off someone. They’d come out perfect with no holes in them. I reason either the density change or increased heat with aluminium is doing something with my plaster moulds. Sounds like you just had too much water in your mold. The plaster I used mixed with 50% sand holds up to 1500F without turning to powder. I heated the mold up to about 1000F which made the mold bone dry. There was absolutely no sign of water evaporating from the mold when I poured and no defects in the cast. Thanks I will certainly have a try adding sand and less water next time I get the furnace out. Is it just me or these guys have overcomplicated the solution? IMHO milling the ballscrew support from a piece of Al stock would have been faster and cheaper. And if these guys have access to 3D printer, they could find another cnc mill/router to do the job. Even more, they could have made temporary mount from plastics to make the real one on this very same cnc machine – the construction looks rigid enough for the job.